Airedale Terrier Club of Victoria Inc. The Airedale Terrier Club of Victoria Inc. was established in 1929 and is believed to be the second oldest pure breed dog club in Victoria. The Airedale Terrier Club is "Dedicated to the Welfare and Promotion of Airedale Terriers". The Airedale Terrier Club of Victoria is an affilliate of Dogs Victoria, the peak canine body in this state, and therefore The Australian National Kennel Council. The club and its members are bound by a code of ethics, incorporation law and by our club's constitution and by laws. Each year the Airedale Terrier Club of Victoria will offer several Airedale Terrier experiences. These may include an annual dog show, grooming training, a memorabillia (Airedale specific) event in the Dog Museum, a Beach Picnic, A Bush Walk, a River Walk, Christmas Party with the Airedales and much more. Persons who have an interest in The Airedale Terrier are welcome to join. Details and forms can be downloaded here. One of the many benefits of membership is our breed club magazine, The Airedaler, which is published four times a year. Airedale Terriers are one of the healthiest of breeds. They are highly regarded as family friendly and while being a capable protector are known to be wonderful with children. Airedales do not shed like most breeds and their marvelous coat is about as anti allergenic as a dog coat can be. ATCV breeders on our register, breed from hip surveyed stock and in everyway are attemping to improve this wonderful quality breed. Our largest ever Airedale Show was 1976 when Arthur Lodge of England was brought to Australia to judge 174 Airedales. This at the time was the world record number of Airedale Terriers at any one show. Current Life Members of the Airedale Terrier Club of Victoria Inc. The Club year runs from 1st. December to 30th November the following year. New memberships paid after 30th September in any year shall be a financial member until 30th November in the following year. Special Note! 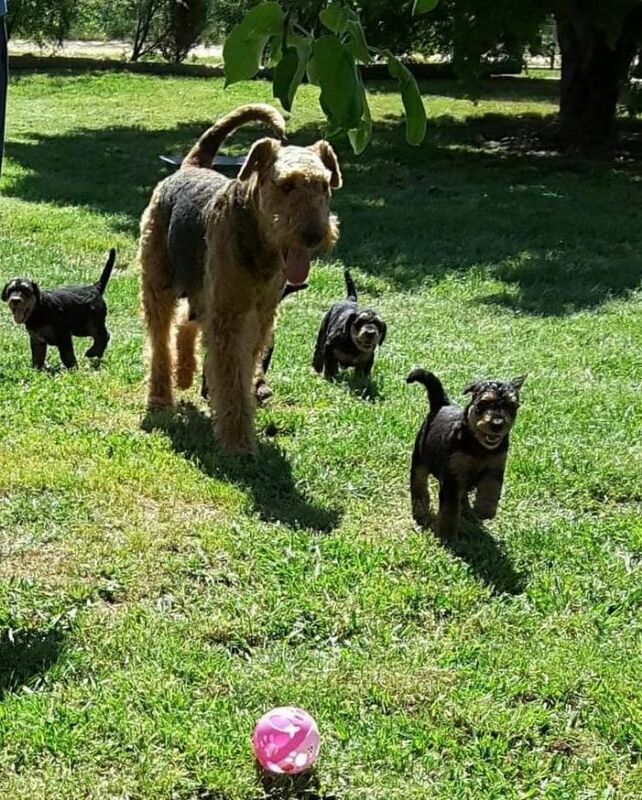 There is also an Airedale Terrier club in New South Wales with links on this web site and found in the Airedale Pages of https://www.dogzonline.net.au/ If you purchase a puppy in Victoria and live in NSW, PLEASE JOIN THAT STATE'S AIREDALE CLUB. Breeders.......please ensure interstate puppy purchasers are encouraged to join the club in their state. Interstate enthusiasts are also welcome to join the Airedale Terrier Club of Victoria.